Pft, when was the last LN>anime adaptation you remember that people were happy with? I think Gosick's adaptation was fine. Sure the end was messed up compared to the LN, but they mostly did a good job excepted for that. Also, the Suzumiya Haruhi series adaptations, except for the stupid endless eight, was really well done. Especially the movie. Baccano's adaptation was original and pretty well done. They really did something interesting with it. Good LN>anime adaptation aren't that rare. Well, horrible adaptations aren't either, but it can't be helped. Agree that's why most people who watched it want another season, and I think this is the reason why the overlord/yuusha theme nowaydas became suddenly popular and comparing to this one. Can someone give me another recent examples ? I do my (english-only based)searches but it seems the novels change titles when they are published, making it difficult to me. I just finished a dengeki bunko series yesterday : "fushigi" toriatsukaimasu Tsukumodou Kottouten. I read the whole 7 volumes those last two weeks. I have to say that I was really pleased by that title. I expected good things from it but it was way beyond what I expected. Also, I'm glad that I didn't know before buying it that it was 4 little stories each time (for the first 5 volumes), or else I may have considered not buying it. Which would have been a complete waste. Almost each of those little stories were interesting to follow. Rather, they really hooked me in and I had a hard time stopping reading in the middle of one of those little stories. For the seventh volume, since each chapter was following the previous one, I started to read it yesterday and I almost didn't stop reading (except for eating and such) from the beginning to the end. -the way used by the author to write the novels is really fitting and really well done. Writing at the first person from 2 different point view (tokiya and someone else, usually that chapter's "culprit/antagonist") which alternates every few pages makes for a very dynamic story telling. Seeing the antagonist's thoughts right from the start easily hook you in, and the author is really good at making you think that the characters said things that they actually didn't said, tricking the readers into thinking that they got the answer of the chapter's main enigma whereas it was just a trap by the author. I really enjoy this kind of things, so I was really pleased by most of the chapters' conclusion. -The fact that among the 4 chapters of each volume, the last one is always dedicated to the relationship of the main couple (in the fourth chapters, those "dual Point of view" are always Saki/Tokiya) is really helping this couple to be likable. Seeing as Saki has almost no emotions and isn't very talkative, the fact that in every volume one chapter is written with Saki's feeling and point of view was a good choice. Without this, it would have been really hard to take interest in Saki. But thanks to this, it's easy to take interest in her feelings. Plus, those last chapters are usually really funny (except for the last two books, but this had to be expected, alright). -The stories are quite cruel, as the author doesn't spare his characters. Being involved with "Antiques" usually lead to the peoples downfall, or to the downfall of the peoples around him/her. Deaths of the main character of the chapter, death of his/her loved one, sometimes even fate that could easily be considered worse than death, characters who lose what they desperately wanted to obtain, characters who lose EVERYTHING but what they obtained, characters being put in situations where every single choices can only lead to bad endings... If you consider that we quite often get to see those peoples' feeling during the whole chapter, including when their downfall happen, we're definitely not in your every day pink-colored LN story here. The illustrator is doing quite a good job as well. Some of the covers like the 3,6,7 were really splendid. That color image with Saki cutting Tokiya's hair is pretty enough to make a good poster, too. Also, this is by far the easiest novel to read that I've read so far, so it would probably be a good choice for anyone starting to read LN in japanese. Also, the amount of text per page is pretty low, so they can be read quite fast. I read the whole volume 7 (400 pages) in less than one day, whereas I would have never be able to do that with other light novels I've read until now. BTW, Tsukumodou Kottouten is available on bakatsuki (2/7 volumes translated in english, 3rd underway) here for those interested. Last edited by Zefyris; 2013-09-30 at 03:49. Do you guya think the merging of kadokawa's group publisher could affect the Light Novel publishing the way it is ? Lare explained it briefly in the fantasia thread, IMO I think it's still in the hands of the company, as of now, the only thing we can expect is to wait and see what are the steps of kadokawa in that merging. 5 hours until the big announcement. The wait is killing me. Guess what just got an anime? It's hereeeeeeeeeeee!!!! My glorious imouto hime-sama!!!!!!!!!! I still think it is a bad idea to animate mahouka though. Too long explanation, and most of them are necessary one at that. I'm afraid it will become another Maoyuu or Index anime. Decent, but a far cry from the deliciousness that is their LN(well, for Maoyuu I think the manga is the superior version though considering the format of the LN ). 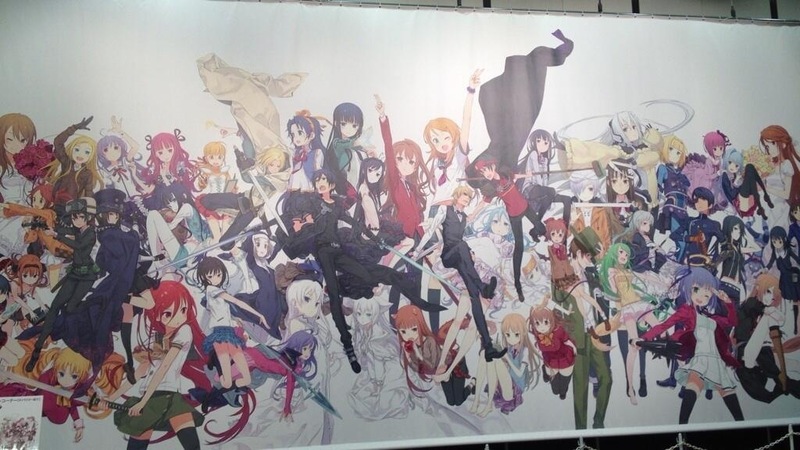 I'm happy that Black Bullet and Mahouka are getting anime because I like them both. It's just that for a Dengeki Bunko Autumn Festival that celebrates the 20th Anniversary of the brand, 2 anime announcements aren't really festive. I was expecting a bit more, I agree. A certain season 3 would have been nice though I guess that will come through the DB Magazine.